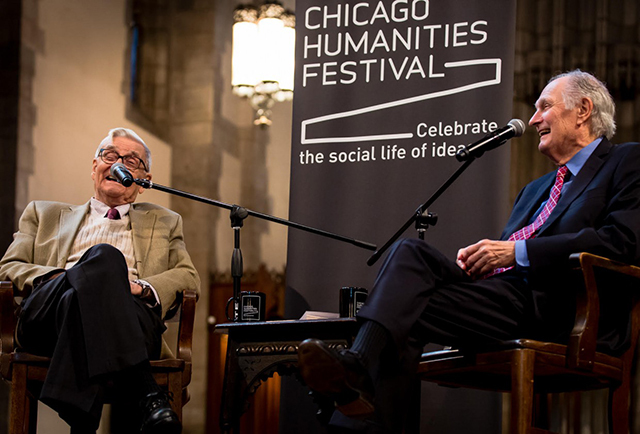 The beloved actor interviewed the preeminent scientist as part of Chicago Humanities Festival this weekend. Wilson (left) and Alda played off each other’s ideas in a philosophical talk. Photograph by David T. Kindler/Chicago Humanities Festival. What happens when MASH’s Hawkeye Pierce interviews one of the world’s foremost experts on biology, ecology, and human nature? A packed crowd at Rockefeller Memorial Chapel found out this weekend when actor Alan Alda, an outspoken advocate for making science accessible to the masses, sat down with scientist and ant expert E.O. Wilson (also known as the “father of biodiversity”) for the Chicago Humanities Festival. The two had a thoughtful discussion on empathy, human creativity, and the relationship between the arts and sciences, while also touching on the speakers’ latest books, The Origins of Creativity (Wilson) and If I Understood You, Would I Have This Look on my Face? (Alda). Here are some key themes that emerged. A.A.: One of the most striking things about the book [Origins] is that it really adds to and appeals to this idea that the humanities and science were not always separate, individual pursuits—and that they need to collaborate again. I always think that art and science are two long-lost lovers yearning to be re-united. And you talk about the First Enlightenment, the Second Enlightenment, and hope for a Third Enlightenment. E.O.W. : I think it’s time for a Third Enlightenment. But it appears to me that right now humanities and creative arts are hobbled by the limitation of our work and the imagination of our two senses: sound and sight. We are audiovisual creatures. We are one of the rare audiovisual creatures on this Earth. A.A.: Romantic poets tell you that there was nothing that science could give you in terms of beauty that compared to a lovely field of daffodils, when in fact the scientists were saying, We can see into the daffodils, we see the beauty of photosynthesis, we see what color really is, and see how the little microbes are making life grow. And all you’re looking at is the outside of it. We’re looking into the mechanism and that’s beautiful as well. And it was this way for a long time. E.O.W. : You know, scientists owe responsibility to that and that relationship. Science—we didn’t call it science until the 1840s. We called it natural philosophy. It was really, categorically, included in the humanities.